Lets you paint buildings directly in-game. This mod adds a Color Field button to the Building Info Panel. Click this button and use the Color Picker to change the building's color. Buttons to Copy, Paste, or Erase are provided. 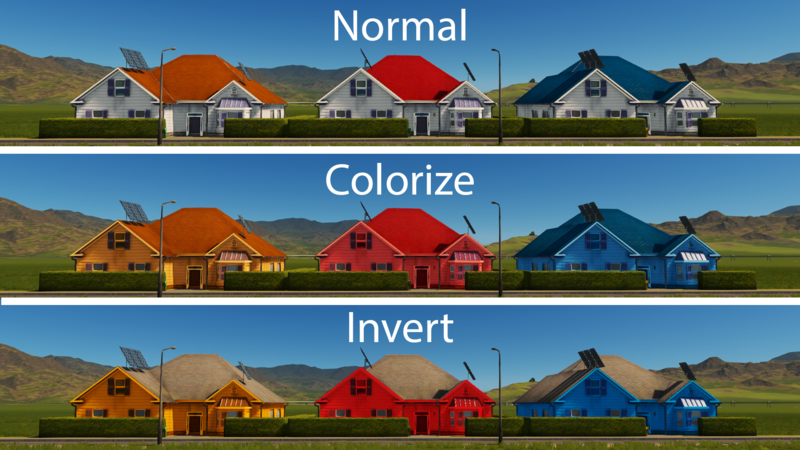 Options to 'Colorize' whole building or 'Invert' the colored parts are also provided. Game restart required for these last two to take effect. This works on all buildings except Match Day stadiums and Festival buildings (These don't change color so no use). Changes are saved in the savegame but the save can still be loaded without the mod. Each building can have its own color. You can have different colors even if its the same asset, unlike other mods like Customize It!, Prop It Up, etc. The parts of a building that change color are defined using a special color map when the asset is created, which means only some parts of the building will change color, depending on the whims of the person who created the building. Some buildings are colored on the roof, others the walls, others the entire structure. For example, in the second image above, you can see only the roofs of the houses are colored. If a building doesn't change color when you use the Color Picker, it means the asset was not made with a color map. (New as of May 2) You can now select Colorize checkbox, then restart the game and the building will have a color map created for it. NB: This mod could have been a part of Customize It! mod, but I decided to split them because some people may not want to use Customize It! and want to use this, or viceversa. The buttons of the two mods sit side by side and don't overlap. Thanks to Judazz and SamsamTS, whos UI code I've modified and used here for the user interface. This mod uses the Harmony Framework[github.com] by Pardeike for method-patching. The unique Harmony ID used for this mod is "com.tpb.painter". This mod uses Bloodypenguin's awesome Translation Framework and comes packed with 5 translations for the mod description and buttons text: Swedish, Dutch, French, Italian, Spanish. If you'd like to add your own translation, let me know in the comments below. I used some code from ModTools for texture work. Guys, with this mod in mind, if you can add color maps to your buildings going forward that would be great! If you want your building to be just one color you can always set all variations to the same color. Adding nice color maps will make this mod useful. Thank you! I have removed the Keyboard Shortcuts. Just use the buttons to copy, paste and erase. Alternatively, you can use SamsamTS's excellent "More Shortcuts" mod to add your preferred shortcuts. I have added 2 new options that only appear if you're subscribed to Prefab Hook: Colorize - Makes the entire building colored. This is useful when a building has no color map, or when only parts of the building are colored and you would like to make it entirely colored. Invert - Inverts the colored parts. This is good for buildings that have only some parts colored, but you would prefer it if it were the other way around. For example. A lot of vanilla houses have color variations on the roof but the walls are all the same. Use this option to make the walls have color and the roofs be the same. You need to restart the game for any of these options to take effect. These options apply to all buildings of the same type. eg. if you invert 1 vanilla police station, all vanilla police stations will also be inverted. Use this only for buildings that really need it. The mod is doing some calculations to perform these conversions so if you have thousands of buildings colorized expect increased load times. Still my most-used mod and works perfectly for me. Only one wish-list item: does anyone know if there is a way to get changes to apply to sub-buildings? Is this mod still functioning as of the newer update? I'd love to use it but am hesitant after just solving a time-intensive mod issue. So that's what's causing all the LODS in every building asset/tree/road etc to go bananas? Roads all turn bright blue, every buiding, prop etc completely disappears and reappears depending on view distance and camera direction. Usually after I've been playing for a few hours then I have to quit to menu, quit DT and restart. Deleting the PainterColorizer.xml fixed the LOD issues for me. I've changed colors on a bunch of buildings since, but the weird LODs haven't come back. I'd definately recommend trying that if your LODs are messed up. Thank you Tai. Thoroughly enjoying this new BigBox of Crayons you gave us :) Love ya ! Can you update 0Harmony.dll in the mod folder?